For the "FlightSim-Avsim-SimOuthouse Round the World Race 2005" (whew, what a title) I made a small tool to help validate the flights. 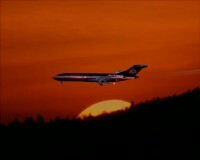 I managed to grab this nice shot of a MD-11 landing near Zürich .... not a photoshop, directly taken from the MS-FS2004! 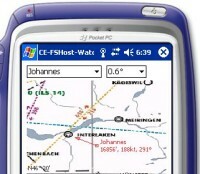 CE_FSHost_Watch will show you where the online-players on a FSHost-Server are currently located. The players will be either listed or shown on a small map (in Switzerland with a nice background-bitmap). The online data is currently proxied on one of my servers and locked for my FSHost-Server. This is a small utility to position your aircraft in MSFS. I created this utility in order help make a few screenshots. Using this utility you can repeatedly generate the exact same position with just a few mouse clicks. Move or rotate your aircraft in all 6 axes plus date/time, in the smallest increments possible. You can also use this utility to aid in mastering complex approaches. More stuff is lined up or in work! Your visits to our sponsors help finance this server!